Six newspapers have endorsed in the Illinois Treasurer's race. And all six of them have NOW endorsed Tom Cross for Treasurer over Mike Frerichs. 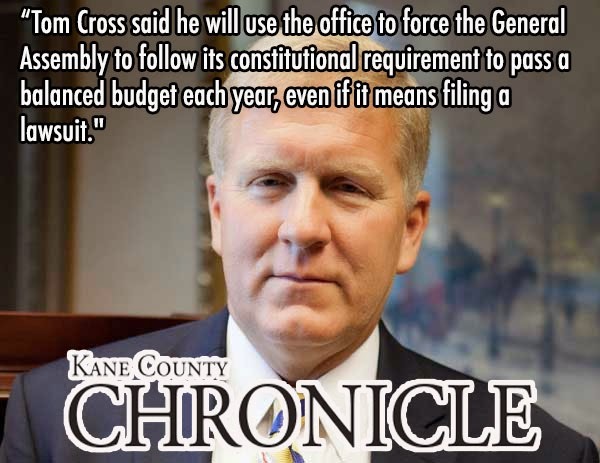 The latest in the Kane County Chronicle who backs Cross and his call for a balanced budget. They also point out - rightfully - that Mike Frerichs voted for the massive Pat Quinn income tax hike and wants to bring new taxes to Illinois residents. Cross, the former House Republican leader, is a fiscal conservative who voted against Gov. Pat Quinn’s 67 percent income tax increase in 2011. Cross said he will use the office to force the General Assembly to follow its constitutional requirement to pass a balanced budget each year, even if it means filing a lawsuit. Frerichs, the former Champaign County auditor, voted for the income tax increase and has supported plans to institute a graduated income tax. Check out the Chicago Tribune's endorsement of Tom Cross here. Check out the Peoria Journal Star's endorsement of Tom Cross here. Check out the Northwest Herald's endorsement of Tom Cross here.